Blog – Homecare Intelligence, Inc.
Can you imagine a world where UPSTM or FEDEXTM, the trucking sector, the busing sector, or many other highly efficient, cost-effective sectors didn’t use algorithms and software to get food to your grocery store or the latest gadget to your door? You might be surprised to know that our health system delivers millions of home care visits every year, without the benefit of those same tools. HCI considers these issues in our position paper on health system innovation in Ontario. In the same way that businesses adapt to their changing markets—reducing costs, adding value for customers, and improving productivity—so too must health systems adapt. While the paper focuses on system level impacts for the Province of Ontario, the concepts within are fully applicable to the stakeholders in any single-payor jurisdiction. Logistics tools that have long been available in most other sectors are finally ready for the challenging future of home care and patient-focused outcomes. A question we often get from our customers is whether or not we support the concept of assigning patient demand within clinician service territories and do we have any tools for building and maintaining these territories? The answer is yes to both questions, but depending on your requirements and specific situation, there are a few ways of implementing this technique. While we have other ways of solving the problem that territories attempts to address, we have implemented several ways of building territories with varying degrees of effectiveness. We will describe each of these approaches as well as discuss the benefits and drawbacks in the sections below. Image 1: Postal codes can sometimes create odd geographic boundaries. In addition to the problem of postal codes not confirming to natural geographic areas, many of them are also not contiguous. They may be represented as separated, non-adjacent areas, or can have “donut-holes” cut out of the center of them. If you choose to build your workforce territories this way, based on your operating region, you may have to consider these postal code oddities. The main benefit for using postal codes is the ease of communication to your employees and general schedule maintenance. At any point you can usually just look at the postal code of a given service appointment and know who within your staff is likely to be assigned. Most people are comfortable “thinking” that postal codes represent a certain area. Generally speaking they do, but the actual postal code of a given location may not match a person’s mental map. The example shown here in Image 1 is not particularly nasty, but you can see it still has problems (the blue dotted line represents the postal code boundaries). While they take much longer to produce, custom formed territories are generally superior to postal codes. Free-form territories allow you to take into account any number of factors when designing territory boundaries. Factors such as population differences within your overall service area, geographical nuances (e.g. a bridge where traffic typically backs up) and even individual preferences can easily be accommodated. The free-form approach produce the best territories, all things considered, with the main drawback being the time it takes to generate. This usually leads to an unwillingness to re-evaluate the territories on a regular basis or when conditions change. Over time this causes the established territories to more and more inefficiently manage patient demand. The effects can be disastrous to patient and clinician satisfaction, not to mention your operational bottom line. The Homecare Intelligence product incorporates the ability to “draw” free-form territories, but most clients choose to use this for ad hoc adjustment after the lines have been drawn in an automated fashion. Optionally, once the territory is drawn, we can display calculated statistics for the area (average number of patients, standard deviation by month, min, max, mean, etc.) if the historical data is available. Our algorithm based territory generation technique came from our clients growing tired of manually drawing out territories. To address this, we created an algorithm for generating the territories automatically based on the average territory population. In this way the algorithm can generate equal sized (in terms of average number of patients) and adjacent partitions of the service area, though not equally sized in terms of square miles covered. Image 2: An example territory generation output showing equal census weighting for each area. The color codes represent different provider branches. Working with our clients, it quickly became apparent that rather than creating larger, overlapping territories, they preferred to have smaller territories that could be assigned to staff as a primary territory, yet allowing them to be assigned as the backup or alternate choice in the adjacent territories. From the example algorithm generated territories depicted in Image 2, you can see the more rural areas are larger than the ones downtown. This is due to the territories being generated based on patient density, not the geographic area. The algorithm we use is called the “shortest-split line” algorithm. It was specifically developed as a response to gerrymandering of congressional voting districts in the US. Voting districts are political dividing lines, and depending on how the district is drawn, they can significantly affect the outcome of an election. The split-line method divides a geographic region into equal (by population) parts based on the density or number of parts you wish to achieve. Here is a link to a study comparing current congressional districts with a split-line version: http://rangevoting.org/SplitLR.html. Image 3: Split-line generated territories overlaid with postal codes. A big benefit to the algorithm generated territories is that they all contain roughly the same number of patients…usually with less than 5% deviation from the mean. Territories can be generated from actual patient address data, population data provided by the US census bureau, or a variety of other sources. The population as a whole, regardless of the branch, then assigned the resulting territory to whatever branch contained the largest geographic region. This happens a lot where two branches meet. The upside is you can evenly divide branches, by dividing the territories evenly. The downside is the branch boundaries will likely change slightly from where they are today. Split each branch’s historical patient population separately. The upside is the branch boundaries don’t change. The downside is one branch may end up servicing a larger number of patients than another. Image 4: An example of post algorithm-based generation free-form editing without territory overlap. We’ve found that using an algorithm generated territory is merely a good starting point. Even though they might be technically correct, there are still instances where they needed to be tweaked to follow a road or natural obstacle (like a river or lake). Combining our free-form territory tool with the results from the algorithm-based generation activities to allow for adjustments has proven to net repeatable results while remaining cost effective in terms of time spent. Image 4 is an example of the territory in “edit” mode that allows a user to change the boundaries and save them. This particular example respects adjacent boundaries and does not allow for overlap. The concept of territory overlap opens up some unique opportunities, as well as additional considerations that need to be taken into account. This will be the subject of a future follow-on post. Homecare Intelligence, Inc. provides several options to assist homecare logistics and scheduling operations. Each of these optimization option solutions comes with it’s own benefits and it’s own conditions and data requirements. In speaking with various companies across the post-acute care spectrum, we’ve found that it’s often easier to talk about these solutions in terms of level of sophistication. The levels of service described below are given in order of increasing data demands, complexity and strategic value, from tactical assistance to broader horizon strategic planning. Geocoding converts resource and consumer addresses into latitude and longitude for mapping purposes. This is useful for basic patient and clinician map production and analysis and is the starting point for all geo-spatial analysis activities. Typical Use Case Generating locations for other routing services, mapping patients and clinical staff. Request Requirements Clinician home address, branch office address, lab drop-off, or patient home address. Benefits Enables map-based analysis of patients, visits, staff, etc. Basic non-optimized routing services. 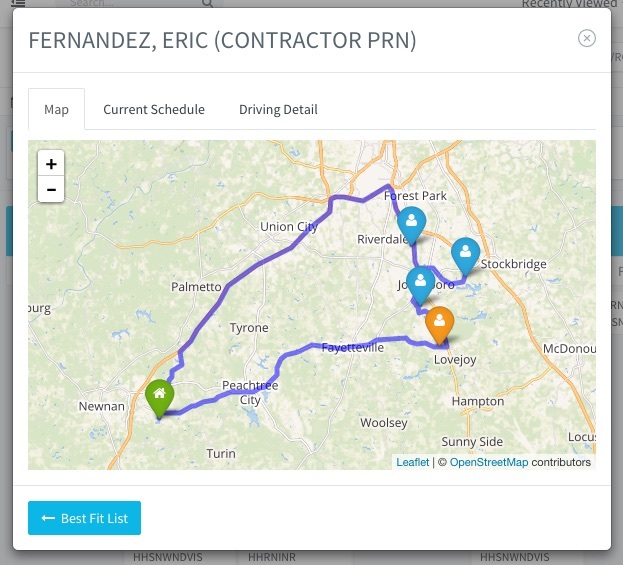 Takes an existing visit schedule (in a given order) and returns the driving statistics (individual route legs and total driving distance and time) for a single staff on a given day. Typical Use Case Calculating daily mileage for clinicians. Request Requirements Clinician location and a list of visit (patient) locations. Benefits Builds an accurate picture of miles driven and time spent driving from visit-to-visit for particular clinician on a particular day. 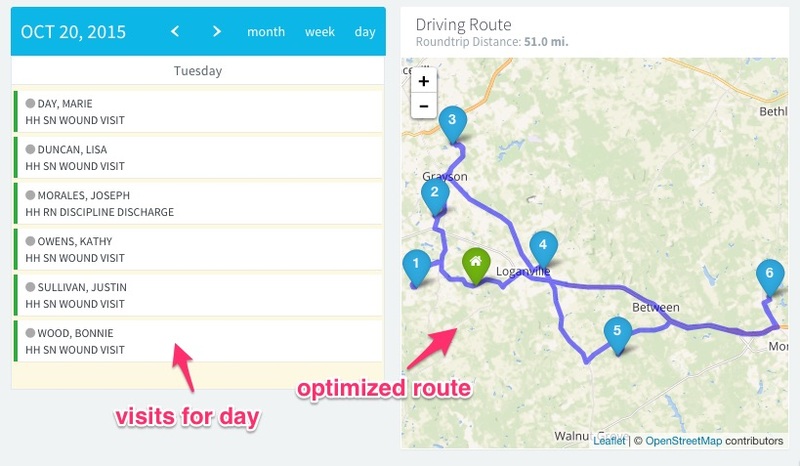 Optimized routing takes a list of waypoints, and returns the optimal order and driving statistics (individual route legs and total driving distance and time) for a single staff on a given day. In addition, it provides the “optimal” order for the visits. It is mainly used by a clinician at the beginning of the day to help them determine the best order to perform the day’s visits. Can be configured to account for specific requirements around clinician and patient availability or delivery times. Typical Use Case Modifying the order of the day’s scheduled visits to be put in the optimal sequence from a driving distance and time perspective. Benefits Reorders a visit plan to ensure driving distance and time are kept to a minimum. Optional Ability to add time windows if certain visits need to be performed at a specific time or within a range of times (time window). Given the dynamic nature of homecare, there is often a need to fit a visit into an established service schedule. The goal of this form of optimization is to produce a list of clinicians that are the best suited to a newly added (or changed) service based on the assigned visits for the day and the existing fleet driving routes. Typical Use Case Generally used to provide ad-hoc clinician recommendations for visits. For example, if a clinician calls in sick (or a patient needs a visit on the current day, etc), this process will examine all the clinicians and create a recommended list of clinicians to perform the visit. The recommendation takes into account the clinician’s current schedule, where they will be driving during the day, and the marginal impact of adding the visit to the current schedule. It will also take into account any patient preferences (both soft and hard constraints) into the calculation. Request Requirements Visit type, visit date, any custom attributes. Optional: list of clinicians, along with existing visit locations, to be considered for recommendation. Data Requirements Existing fleet schedule consisting of visit types, clinicians with locations and visit types they can perform, current clinician fleet schedule for day and their individual availabilities. Benefits Accommodates the dynamic nature of providing homecare services by helping agencies cope with the constant schedule modifications necessary to fit daily changes to service demands. 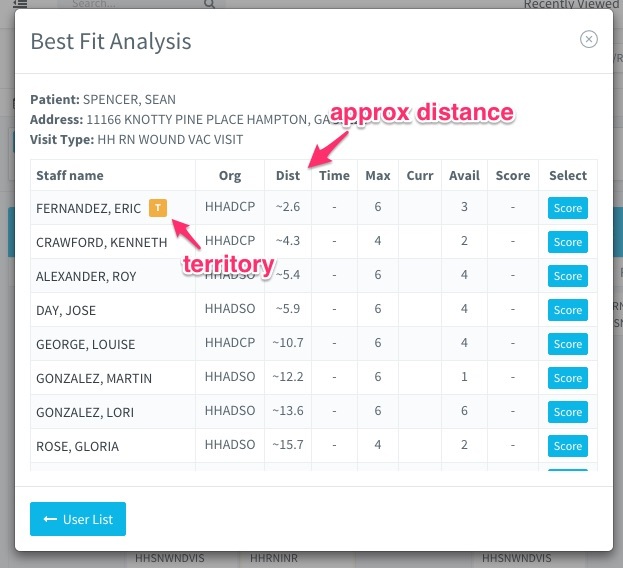 As a real-world example, in the Homecare Intelligence product, the visit optimization process will honor any territories that have been established for the clinician. The “Dist” column is the closest approximate “as-the-crow” flies distance between the patient and either: 1) the clinician’s home or 2) one of the other visits the clinician is performing on the day. To get the true driving time, the user can click the “Score” button. This will calculate the optimized routing distance and time for the existing schedule, then calculate the optimized routing distance and time if the visit is added to the clinician’s schedule for the day. In the above case, after the scoring is complete, the distance now shows “6.0”. This means that if you add this visit to the clinician’s schedule, it will result in an extra 6 miles of driving to the day’s driving. Daily optimization is a holistic approach to daily patient visit planning. For a given clinician/patient grouping, (provider branch, fleet, etc.) daily optimization takes into account all the visits that need service for a given day, plus all the clinicians that are available and determines the best schedules “as a whole”. The process minimizes total drive time and distance over an entire organization location while keeping in mind service constraints (i.e. skilled nurse visit with wound care), preferences (i.e. patient prefers Spanish speakers). The algorithm will maximize the productivity of the clinician resources, based on the visit demand. Typical Use Case Optimally scheduling an entire day of services. Request Requirements List of clinicians with location, availability, skills and other attributes. List of patients/visits with location, duration (or visit weight) and required skills and/or preferences. Benefits Minimizes overall drive time and increases staff productivity by recommending the right staff to assign to a given service, while holding all provided constraints in balance. Particularly useful in situations where patient continuity of care is not a top priority (staffing services, etc.). Consumer assignment optimization is a long-range visit planning process. The goal is to identify the best “primary” clinician who can perform the greatest number of visits, thereby increasing patient continuity of care. The process will examine the patient visit requirements for the entire episode and examine all the clinicians’ schedules, location and current patient load to create the recommendation list. The result is a prioritized list of clinicians that are best suited to be the primary or main clinician for a given patient over the course of an episode of care. In the event a single clinician cannot perform 100% of the estimated patient visits, the algorithm will also return an alternate clinician recommendation list for the remaining, unassigned, visits. Typical Use Case At time of admission, the scheduler will run the primary optimization process to get a list of recommended clinicians to act as primary or case manager. Request Requirements Patient location, list of patient visits. Data Requirements Visit types, clinicians with locations and visit types they can perform, clinician current schedule for entire period and availability. Benefits Enables long-range planning in the assignment of a primary (and alternate) clinicians to particular patient services. Increases patient continuity of care. Helps “cluster” clinician patients in as small an area as possible. Patient optimization can take into account many factors, but it should first and foremost be focused on clinician continuity.